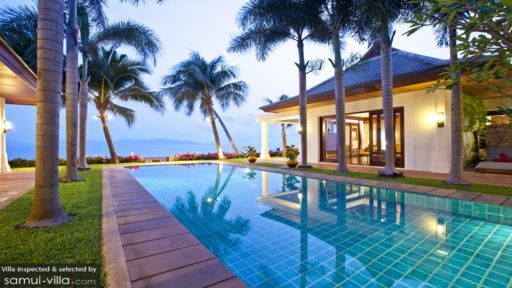 Located in Koh Samui’s Mae Nam beach, Villa Gardenia is a scenic five-bedroom holiday home which features excellent services and accommodation for guests traveling to Thailand. 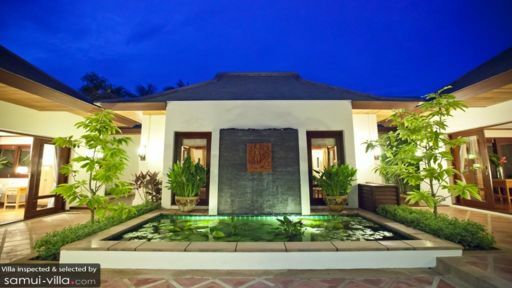 The villa has a contemporary décor and architecture complete with an opulent design that truly brings forth Thai warmth and hospitality. The villa is oceanfront so the guests can enjoy endless views of the ocean as they lounge by the pool. With bedrooms housed in separate pavilions, there is a lot of privacy and exclusivity within the villa as well! The five, well-furnished bedrooms at Villa Gardenia are spread across three pavilions for added comfort and additional privacy. The air-conditioned bedrooms have every comfort you could dream of including king-sized and twin beds, writing desks and a cozy ambiance. The hardwood floors are furnished with armchairs and the open-sided plan, with glass doors, look out to the tropical gardens. The walls behind the beds are upholstered with rich fabric for an opulent look. Each of the five bedrooms is accompanied by an en-suite bathroom which has large bathtubs and a partially open tropical garden. Verdant gardens and dense, tropical foliage make up the outdoors at Villa Gardenia, staying true to its name. The villa’s lawns are manicured to the tee and feature exotic plants and trees growing in abundance that create a fresh and wholesome ambiance for a relaxed and rejuvenating space. A 14-metre swimming pool is accessible 24X7 for guests, so you can play pool games, swim laps, float on your back, or lounge as you breathe in the fresh air and take in the scenic beauty of the ocean sparkling in the distance. Sun chairs have been put on the pool deck for your comfort, as they are the ideal spot after a swim in the pool. The landscape is highlighted by a remarkable koi lotus pond which adds a meditative and soothing ambiance to the surrounding area, so you can really relax in your personal oasis. An exquisite living area has been designed to afford the utmost comfort and luxury to guests of Villa Gardenia. It is located right across from the swimming pool and offers a peak across the pool towards the ocean. 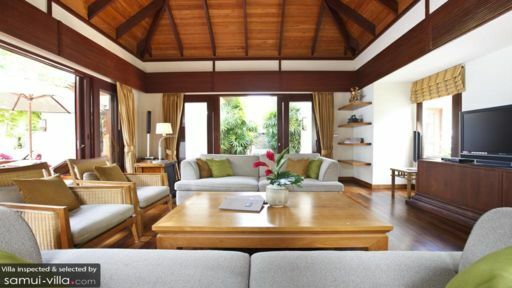 The room features a traditional Thai roof and modern amenities including comfortable sofas, a flat-screen TV, and plush armchairs. The sliding glass doors can be left opened to let the ocean breeze seep into the room and ventilate the spaces. Through the living area, guests can reach the dining area which has a lavish round table with 10 chairs suitable for guests. Another option is the alfresco dining area with a lengthy ten-seater dining table. The views of the outdoors can be appreciated through glass doors, for a picturesque scene while you have your meals. With ample services on offer, you are sure to enjoy your time at Villa Gardenia. A team of highly-skilled employees will cater to all your needs including a private chef who will prepare some delicious local delights. The staff can arrange for a BBQ for the guests as well for a fun afternoon party! The villa is an oceanfront villa, which means you are close to the beach where you can indulge in watersports, surfing, swimming and the works. Bo Phut beach is another one in the vicinity which is more suited for a laidback and easygoing time on its sandy shores. Several restaurants you can try out for their delicacies are Angela’s restaurant and The Boudoir for classic French cuisine.